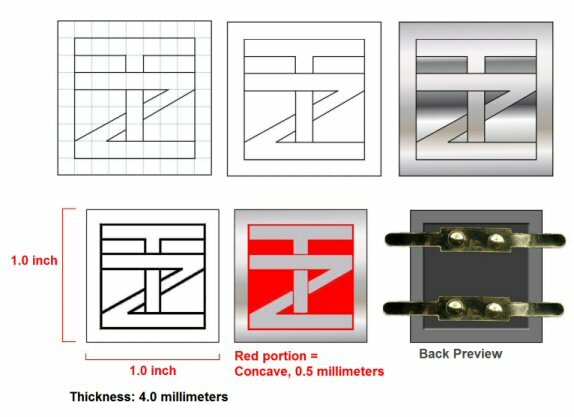 For those who have been following along these last few months, I have endlessly complained about how giant the first metal logo plates were. Nobody’s fault but mine. 2 inches by 2 inches seemed all right at the time. And I still love them. They’re just, you know, flashy, excessively showy and garish. In the metal logo plate remake, version 2.0, I went for a much smaller size, 1 inch by 1 inch. I cut the actual size out of paper and placed it next to the old logo plates for comparison. See above. The difference between the before and after? Huge. Before, the 2″ x 2″ TZ logo plate was at the front and center of your attention. Now, with the 1″ x 1″ logo plate, you’ll actually look at the bag. Imagine that. Stay tuned for more progress reports, as they should be coming in with greater frequency. We project to complete all samples production by the end of this summer. This entry was posted in Learning Curve, One Step Closer, Progress. Bookmark the permalink. This is definitely a good update. Knowing how large that bag is, the logo would be over powering. I can't wait to see what other templates you come up with !